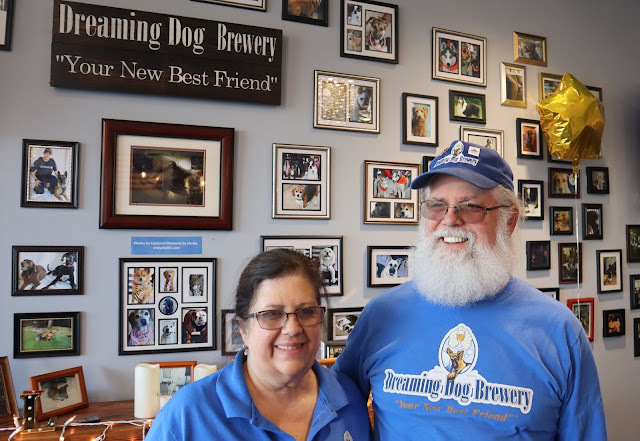 For the proprietors of Elk Grove's Dreaming Dog Brewery, the last several months have been two opposing tails. The first tale was of the successful launch and establishment by David and Elizabeth Brown of their popular brewery and tasting room located at the Stonelake Landing shopping center on the west side of Elk Grove. Their efforts to build a friendly, community-based gathering spot was recognized by the Elk Grove Chamber of Commerce and awarded the Brown's with the 2018 Rookie Business of the Year. The other tale came with the announcement by their landlord, California Northstate University, that as part of their proposed $750 million hospital, the shopping center where the brewery is located would be demolished. That news created a swirl of activity not only for residents in the nearby Stonelake and Lakeside neighborhoods but caught the Brown's by surprise as well. In our conversation, along with brewery talk, David Brown discusses what the future may hold for the community gathering place that has quickly become a favorite for many Elk Grove residents. 'Easy Mark' Grove to the rescue! CNU gets themselves into a pickle, 'Easy Mark' pulls out a big bag of taxpayer money and sets the new Dreaming Dog owners up in a building like the Civic Center, Rite-Aid or the dilapidated brick building along the railroad tracks. Then the 'Easy Mark' PR machine peddles another economic development success story to the local TV stations..and hey, maybe there's even another Key to the City somewhere in this story!